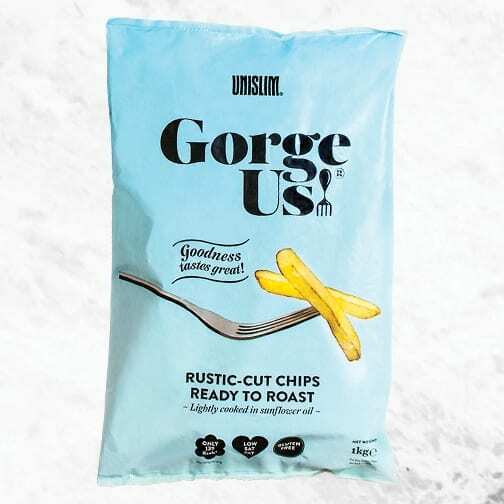 At Unislim we love eating honest good food which comes from a reliable source, which is why in 2015 we decided to launch our ‘Gorge-Us’ food brand by introducing the Irish market to our very first product, our delicious Rustic Cut Chips. A healthy and tasty option for slimmers and health-conscious foodies. In 2017 we grew our brand further with the addition of the hugely popular Skinny Sweet Potato Fries along with Organic Skinny Fries and Sweet Potato Wedges in 2018. 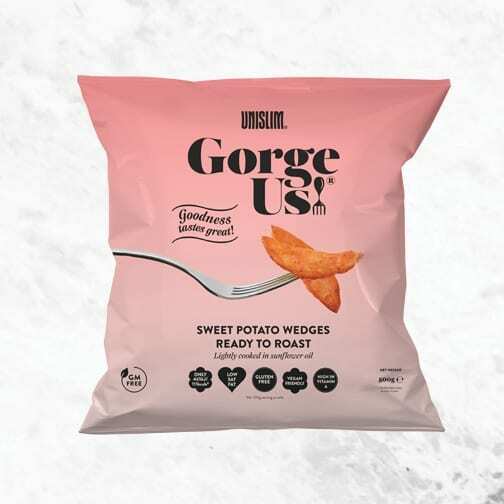 Our Gorge-Us range has been created by the Unislim’s top food experts. We use only the best potatoes for all our products and with a slight sprinkle of sunflower oil, they get the seal of approval from top Irish dieticians. 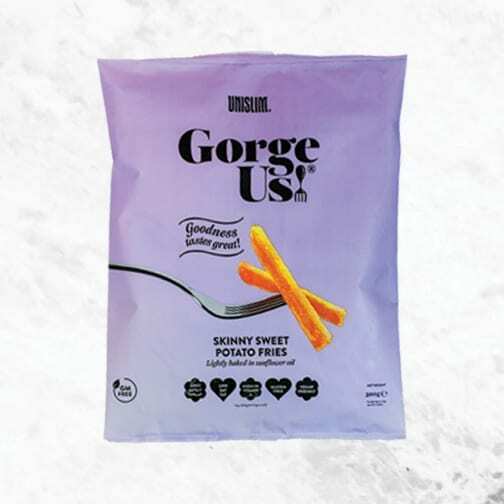 All of our Gorge Us products are Gluten Free, Vegan-Friendly, Low in Saturated Fats, high in Vitamins A & C and contain no artificial colours, preservatives or flavourings. Potatoes are rich in fibre, vitamin C, potassium and iron and are an energy fuelling carbohydrate and can be enjoyed as part of a healthy balanced diet. Our Rustic Cut Chips are made just for you. Our farmers planted each potato with love, so they would grow to be the healthiest, most gorgeous food on your plate. And what’s better, we’ve got the nod from top Irish dieticians and the food experts at Unislim, giving you the super healthy seal of approval. Get Gorge-Us, inside andout. For best results cook from frozen. Appliances vary, the following are guidelines only. Please ensure these fries are piping hot before serving. Do not reheat. For 20-22 minutes or until golden and crispy. Preheat oven to 200°C/Gas Mark 6. Spread the frozen Rustic Cut Chips in a single layer on a baking tray and roast, turning once, until crispy. Try with a sprinkle of paprika for a spicy kick, or add some chopped garlic and fresh parsley…delicious! If you are following our Unislim healthy eating plan, you can enjoy a 100g portion of Gorge-Us Rustic Cut Chips at mealtimes. Thereafter, add 1.5 Bites per 100g portion. Our Sweet Potato Fries are made just for you. Our farmers planted each potato with love, so they would grow to be the healthiest, most gorgeous food on your plate. And what’s better, we’ve got the nod from top Irish dieticians and the food experts at Unislim, giving you the super healthy seal of approval. Get Gorge-Us, inside and out. Sweet Potato (86%), Sunflower Oil (6%), Rice & Maize Flour, Modified Potato Starch, Potato Dextrin, Salt, Raising Agents: Diphosphates and Sodium Carbonates, Stabiliser: Xanthan Gum, Spice Extracts: Paprika, Turmeric. For 15-17 minutes or until golden and crispy. Preheat oven to 200°C/Gas Mark 6. Spread the frozen organic fries in a single layer on a baking tray and roast, turning once, until crispy. Tip: For extra crispy Sweet Potato Fries bake on aluminium foil. Turn up the heat with a sprinkle of smoked paprika, or for more of a savory flavour, add some grated parmesan and some cracked black pepper. If you are following our Unislim healthy eating plan, you can enjoy a 100g portion of Gorge-Us Sweet Potato Fries at mealtimes. Thereafter, add 1.5 Bites per 100g portion. Our organic skinny fries are made just for you. Our farmers give our sweet potatoes extra love and attention, so they would grow to be the tastiest and most nutritious food on your plate. Pop them in the oven and enjoy. Organic Potatoes *94%, Organic Sunflower Oil* Fructose. *Products from organic farming. For 16-18 minutes or until golden and crispy. Even more delicious served with a homemade garlic dip made from light mayo and freshly chopped garlic. 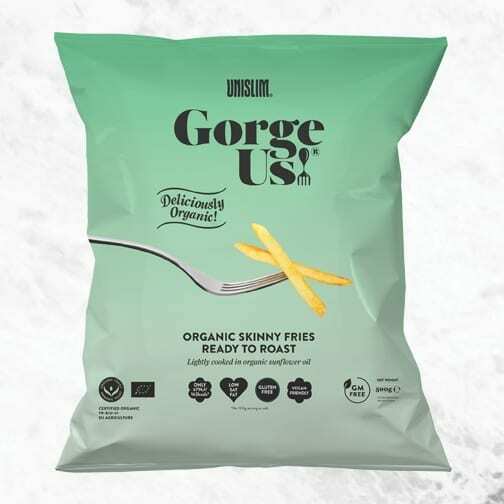 If you are following our Unislim healthy eating plan, you can enjoy a 100g portion of Gorge-Us Organic Skinny Fries at mealtimes. Thereafter, add 1.5 Bites per 100g portion. Our sweet potato wedges are made just for you. Our farmers planted each potato with love, so they would grow to be the healthiest, most gorgeous food on your plate. Pop them in the oven and enjoy. Sweet Potato 91%, Sunflower Oil, Rice & Maize Flour, Modified Potato Starch, Potato Dextrin, Salt, Raising Agents, Diphosphates & Sodium Carbonates, Stabiliser, Xanthan Gum, Colours: Paprika Extracts, Curcumin. For 20-25 minutes or until golden and crispy. Preheat oven to 200°C/Gas Mark 6. Spread the Sweet Potato Wedges in a single layer on a baking tray and roast, turning once, until crispy. Tip: For extra crispy Sweet Potato Wedges bake on aluminium foil. Add a spicy kick with a sprinkle of Cajun seasoning or turn up the heat with some chilli flakes. If you are following our Unislim healthy eating plan, you can enjoy a 100g portion of Gorge-Us Sweet Potato Wedges at mealtimes. Thereafter, add 1.5 Bites per 100g portion.